A reality of a project like the City Rail Link is disruption. This disruption creates challenges but it can also provide interesting opportunities too. Albert Street will be reduced to a single through lane in each direction between Victoria Street West and Wellesley Street West. It will not be possible to maintain existing bus stops during this phase of CRL enabling works. The Western bus services that currently use Albert Street between Wellesley Street West and Victoria Street West need to be relocated. The new routes proposed due to the CRL changes will have all these buses travelling one more block along Karangahape Road and then turning left down Queen Street. The route will then split with some bus services turning left on to Mayoral Drive (affected services: Great North Road 18, Titirangi 195, 171, 171X, 209 and Glen Eden & Ranui 151X) and the remainder continuing along Queen Street and turning left on to Victoria Street West (affected services: Te Atatu 132, 132X, 133, 133X, 134 and Westgate 110,125X,129). These changes will be effective from January 2018. More information will be provided at the time to ensure that people know where and when to catch their bus – there will not be any impact on the frequency of services. I’ve got a few concerns with what’s proposed. One of the reasons the earlier changes had a notable impact on the use of some buses is that it reduced level of coverage some routes had of the city centre. Where previously some of these buses travelled all the way to Britomart, they were then terminated at Victoria St resulting in a longer walk for some or for others changing how they travelled. For some buses, particularly those on Route 2 above, this pushes buses further south in the CBD, once again making it harder for users. It’s also not clear exactly where the buses terminate and where passengers would have to go to board the bus at the start of its route. If all western buses are going to be heading further along Karangahape Rd and down Queen St then they’re going to need appropriate priority. Something for which there is no mention in on ATs website about. Victoria St could do with this too. The closest thing is this mention about Karangahape Rd. We will be undertaking a separate consultation process to discuss the impacts and proposed changes on Karangahape Road between Pitt Street and Queen Street. This is being worked on in conjunction with the Karangahape Road Enhancements Project that is being rolled out next year. We will be consulting on this in October. Bus priority on all of these streets is essential and needs to go in at the same time as the bus stop changes. One of the more notable outcomes of the current CRL works has been the general lack of impact they’ve had. There might be a gaping hole in Albert St right now but ATs monitoring shows that vehicles on many city streets are actually travelling faster than they were before the works started. This creates huge opportunities for AT and the council to think differently about how we use the space we have. As the project progresses, some of the space that was previously taken up for construction is being returned to its former state. The next for this is likely to be the Customers St intersection which could see more lanes reinstated as early as this weekend. It’s a huge shame AT look set waste this opportunity. I would feel a lot happier if AT would announce long term plans for all CBD bus routes (not just changes they talked about for mid town earlier in the year). I really do hope they are looking at the long term picture. It is quite disappointing if AT simply hands space back to cars. I feel they should maintain the existing congestion and any future travel time benefits should only be captured by buses and peds in the CBD. CRL works is keeping cars out, keep it that way. Now is the time to be brave and radical. Ban turns, simplify traffic light phasing, create one way roads and remove the unneeded lanes, remove parking, pedestrianise queen st or at the minimum just ban all cars and bring it down to one vehicle lane each way for buses. The footpaths are choking with so many peds. It’s like AT has no eyes and is blind to future trends, has no heart or passion to make this city truly people focused, no guts to do something different than build stuff for cars and no brains to work out that catering for cars in the CBD only leads to bad safety, environmental, economic and social outcomes for almost everyone. It’s like they have to be dragged kicking and screaming to do anything to serve their customers. Prioritising motor traffic over everything seems to be the typical response of most transport authorities in the English-speaking world. You have to go to Continental Europe or Scandinavia to see more-enlightened policies. And it has been this way for decades. But who knows, maybe AT will surprise us by not mindlessly re-opening the floodgates for cars as soon as the CRL disruption is finished? Kari, if a person who has not experienced Auckland’s public transport read you post then they would think how unbalanced it is -where are the positives? Sadly you are spot on. We have an approach that has no vision but it also has no economic insite. As a country if we have realised that public transport provides huge economic benefits for many then we certainly have not embraced that. As an example AT are still making huge investment in car parks that are doing little to encourage public transsport usage. Customs Street and Fanshawe Street need to be turned into an urban busway the day the Customs Street/Albert Street intersection can reopen. It’s already 9 years late, why should we wait any longer? The westbound route on Victoria St between Queen St and Albert might be the slowest, most congested block in the city in the evening peak. Sending more buses down it should be avoided at all costs. Sadly, westbound on Customs is sometimes only marginally better. Unless the implement some stringent bus priority measures (eg closing off the Eliott St rat run, merging westbound traffic on Victoria St to one lane BEFORE crossing Queen St), AT should look at alternative routes. OT but is GA going to push AT/CRL Ltd on the backfilling of the CRL cut n cover sections? It just seems very backwards to me to be backfilling in a large space that could so easily be used for a variety of purposes (future PT, bike lanes, pedestrians, shops, utilities etc). The area is going to have to be strengthened anyway to support the weight above the tunnels etc so they might as well just leave it as a a void. Could make an amazing bike lane out of the weather and fumes etc! Err don’t the CRL tunnels go in the void? Nick CRL tunnels are well beneath the surface for most of their length. Above them is going to be filled in with dirt/fill then the road goes on top of that. This could instead be left as a void and used for a multitude of things. To do this you’d need two structural lids – one over the tracks and then another to hold the road. Filling must be simpler as you just have the one lid over the tracks then a whole lot of dirt. They are currently putting a lid on at road level, but it must be temporary only while under construction and explains why it is done out of cheaper materials (uncoated steel beams). Except the weight of the fill will be much greater requiring stronger/more expensive supports below. Not too mention every time someone wants to put something in under the street they dig it up and cause huge inconvenience to both motorists, pedestrians and cyclists alike. They should have closed all potentially affected roads to the private car except for some specified non-peak hours each day, for the entire duration of works. This could have allowed buses to continue to operate as closely as possible to their original routes, and kept travel times for PT users “reliable”. Because we know that reducing travel times is only one goal, keeping those times “reliable” is another. 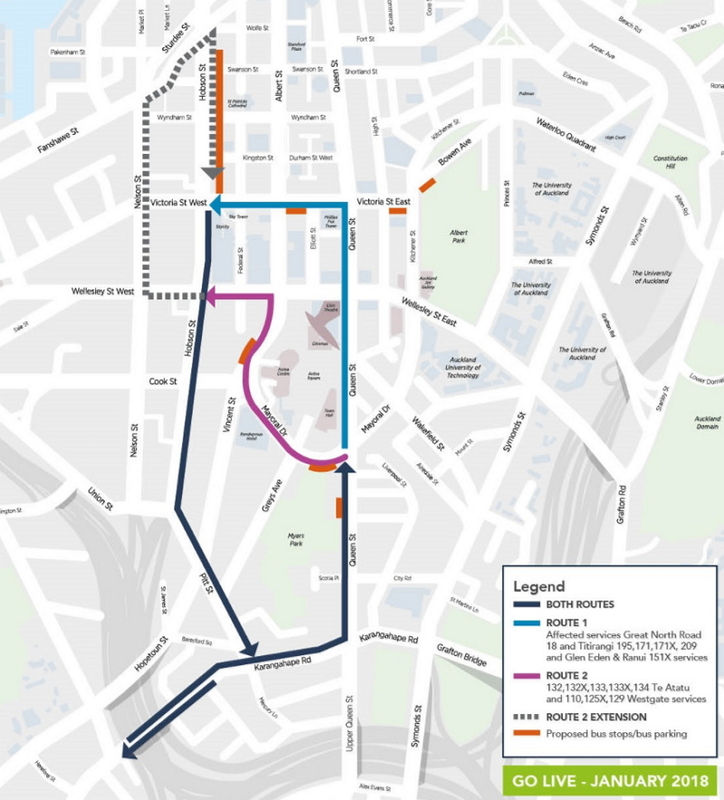 If I read that correctly, NW buses will now enable a much closer connection to the NEX on Fanshaw St? Yes with that extension of down Nelson & up Hobson. Yes you’re right, seems back to front. Wonder which is right the map or the words? The best network is a cross network with city in the middle. That means bus run from East to West, North to south continously. The challenges is that may require different bus operators to co-operate routes.